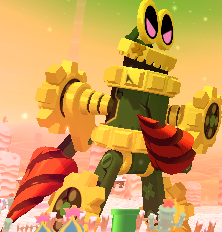 Robo-Drilldigger is a giant robot boss in Mario & Luigi: Dream Team. It is the main boss of Dreamy Dozing Sands, and the first giant battle in the game. Robo-Drilldigger is a giant mechanical robot, made entirely out of drills and cogs. Robo-Drilldigger was formed out of floating mechanical drill-like objects in Dreamy Dozing Sands by Dream Stone spirit, who was annoyed by Mario and Dreamy Luigi attempting to convince him to locate where the Dream Stone was. Robo-Drilldigger, after forming itself, causes the Luiginary Stack to collapse, leaving Dreamy Luigi, Mario, and Prince Dreambert in danger. Dreambert tells Starlow to touch the L on Luigi's cap and Dreamy Luigi starts absorbing Luiginoids, growing into Giant Luigi. When enough Luiginoids are absorbed, the player must turn the 3DS into a sideways position and start battling Robo-Drilldigger. After the Bros. defeat the Robo-Drilldigger, the Dream Stone spirit will tell the location of the Dream Stone, but to Dreamy Luigi only. Robo-Drilldigger first attacks by creating a tornado around itself and sending out smaller tornadoes to Giant Luigi which must be jumped over to avoid. After doing this, it sends the tornado it is in to the background. Robo-Drilldigger can then be knocked into the tornado with a Hammer Chop for extra damage. The player needs at least a "Great" from the Hammer Chop to send it into the tornado. Robo-Drilldigger will then change its form into a mobile vehicle with its drills sticking up to prevent Luigi from performing the Jump attack on it, forcing Luigi to have to hammer it instead. In this form he attacks by trying to ram Luigi, which can be countered with the hammer. Robo-Drilldigger can also change into an aerial form that can't be hit with the hammer, but instead has to be jumped on. In this form it fires 6 drills at Luigi, after which he tries to swoop down and ram Luigi again, all of which can be countered with the hammer. After Luigi does enough damage to Robo-Drilldigger, it fires a giant energy ball at Luigi. The first time this attack is used, it cannot be countered (and begins a tutorial about the Rhythm Mushroom move), however, after the first time it can be countered by repeatedly swiping over the Touch Screen in the direction of the laser. The unavoidable attack can't KO Luigi, however, and the Rhythm Mushroom tutorial does not use an attack turn and lets the player repeat it as many times as is desired. If the attack is not countered later, however, it can KO Luigi. After it has taken even more damage, a short animation shows that it is damaged and it hides in an even bigger tornado in which he isn't visible at all. He also can change forms with the player only catching mere glimpses of Robo-Drilldigger's head's current position, which if seen the last of, will allow Luigi to deduce what form it is in. When it is his turn to attack, he breaks the tornado and attacks in whichever form it is at that moment. After he attacks, Robo-Drilldigger recreates the big tornado. In the Hard Mode, Robo-Drilldigger sends two joined tornadoes instead of one at Luigi, making him have to jump at a much riskier time than before. It also fires several more drills than normal at Luigi, and possibly moves faster when trying to ram Luigi. In the Battle Ring, Robo-Drilldigger X must have all of its attacks countered perfectly, as well as be struck with the maximum potential damage possible with Luigi's attacks in order to be defeated within the strict 10 turn time limit. French Excavatron From excavatrice (excavator) and the suffix -tron used for robots. Portuguese Escavabot From escavar (dig) and bot. This page was last edited on January 22, 2019, at 00:00.